Chew on this. As humans in the animal kingdom, the importance of good dental hygiene habits are taught to us at a young age. Are you aware of the importance of your pet’s dental health and check-ups? Like their human guardians, health issues can stem from bad dental hygiene. Did you know that humans have 32 teeth, cats have 30 teeth and dogs have 42 teeth? Dogs love to chew causing more wear and tear on teeth. Our staff at Desert East Animal Hospital in El Paso wants you to have some information regarding your dogs, cats, or exotic pet’s dental care. Is your pet a dental superstar? The good news is that you can be the superstar through providing a good diet, daily good hygiene, and annual professional veterinarian dental cleanings. The good news is that you can make your pet a dental superstar through daily hygiene, a proper diet, and annual dental cleanings. 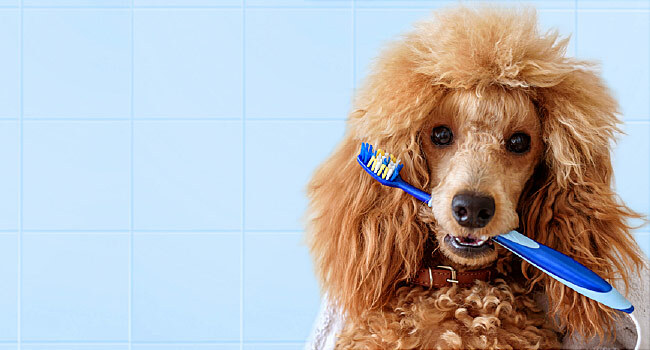 Brushing daily with pet specific toothbrushes and fluoride free toothpaste is the first step to improving your pet’s hygiene. Talking to the Desert East Animal clinic veterinary team about tasteless dental rinses that are added to the pet’s water and coats the teeth making it challenging for plaque to stick to teeth is important. Preventative procedures and annual veterinary dental cleanings will not only save you money in the long run, but it will also keep your pet in tip-top shape and spare the suffering and unnecessary pain. Poor dental health goes beyond the bad breath and stained teeth. Oral disease in cats and dogs is a frequently diagnosed preventable health problem due to the mouth being a perfect breeding ground for bacteria. For all your pet’s healthcare and dental needs, Desert East Animal Hospital is the one stop shop in El Paso TX. We work on exotic pets, cats and dogs and are a family owned business that believes in providing nothing but the best care. Visit one of our veterinarians for dental treatment!